The Monitor 2 combines all the necessities of a professional monitor desk with elegant design feature aimed at speed and clarity in use - such as Split outputs that allow easy connections to a FOH mixer without using splitter leads. And because versatility is a priority in all of the Spirit Range designs, the Monitor 2 is flexible enough to perform FOH mixing where no other mixer is available. Available in 24, 32 and 40 channel frame sizes, Spirit Monitor 2 has twelve sends including two stereo pairs specifically for in-ear monitoring. 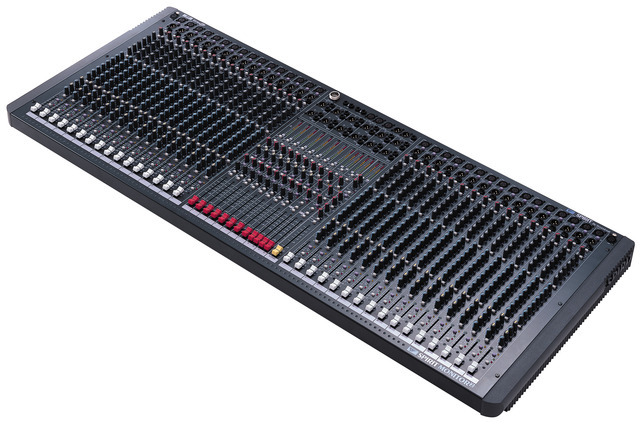 All Monitor sends are pre-post fader switchable and, in addition, each input has a built-in mic splitter, negating the need for dedicated splitter boxes on stage. Monitor 2 has 4 band EQ section with two mid-swept frequencies on every input, plus EQ in-out switches. Other features include a DIM Switch, alleviating feedback problems by immediately attenuating each monitor output by 6dB, two dedicated effects returns and two house mic heeds, allowing performers with in-ear monitors to hear the audience as part of their mix.